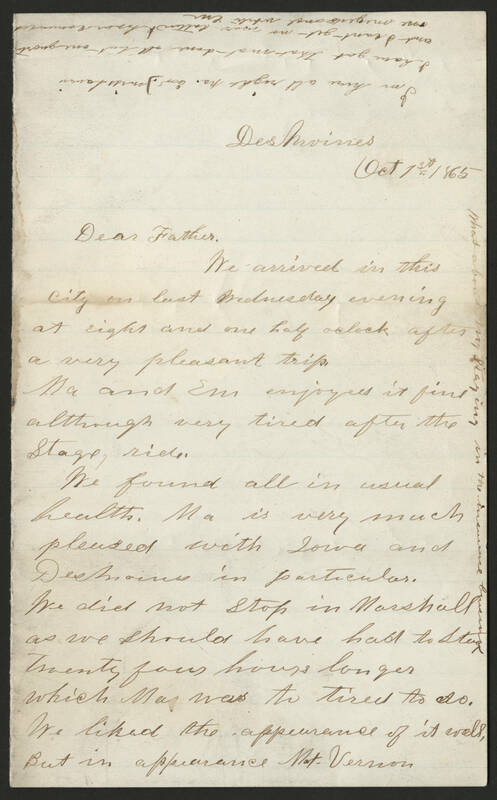 DesMoines Oct 1st 1865 Dear Father, We arrived in this city on last Wednesday evening at eight and one half oclock after a very pleasant trip. Ma and Ew enjoyed it fine although very tired after the Stage ride. We found all in usual health. Ma is very much pleased with Iowa and Des Moines in particular. We did not stop in Marshall as we should have had to stay twenty four hours longer which Ma was to tired to do. We liked the appearance of it well, But in appearance Mt. Vernon.